It doesn’t seem appropriate to blog about my meat birds all summer, and then skip the final step: we harvested the last of our meat birds last week. This process is not fun. It is, however, an important part of owning our food. Chicken day lets us say “Yes, we take responsibility of the meat which we eat.” And I believe that’s important. I divide the process into two steps. The first steps happen out doors. Plucking, gutting – I think of these at the “dirty” steps. 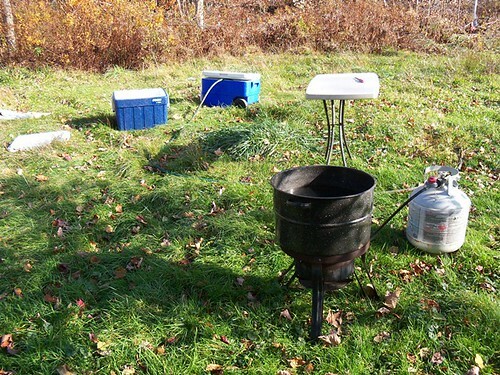 The scalding pot lets us pluck more easily, the coolers chill the meat until we can move it inside. Chickens (like all living creatures) do not have bacteria in their muscles. So tell me – why do we ALL accept that chicken must be cooked until it isn’t pink to kill the salmonella? It’s because the process of slaughtering a chicken is so very hard to do at any speed without spreading the germs from the chickens large intestines everywhere. Slaughter happens quickly but deliberately so I can make sure the chickens don’t suffer any more than necessary. Plucking and gutting happen slowly and patiently- they’re done outside so we can avoid spreading feces and make sure the meat going into the coolers is clean and safe. Also outside requires less scrubbing afterwards. Once the birds are cleaned and in the coolers they look like giant rotisserie chickens – more like something you’d find at the store. We move inside now and butcher the whole roasters into halves and quarters, drums & thighs, boneless skinless breasts, stir fry meat, etc… We part out the portions down to sizes that are useful to us. 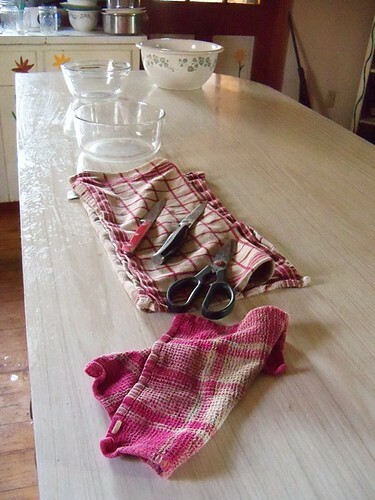 Sharp knives and lots of towels are needed, but at least I can sit down now. Once the meat is bagged and in the freezer there’s still more to do. Chicken fat is rendered down to schmaltz. Leftover bones and meat are simmered down to stock and soup. I clean up and freeze the livers, kidneys, and hearts. When you’ve put this much of yourself -your emotions, time, effort, and yes money- into raising 24 chickens wasting a single portion is very clearly unconscionable. Miraculously we pulled it off! I (of course) knit my gifts. 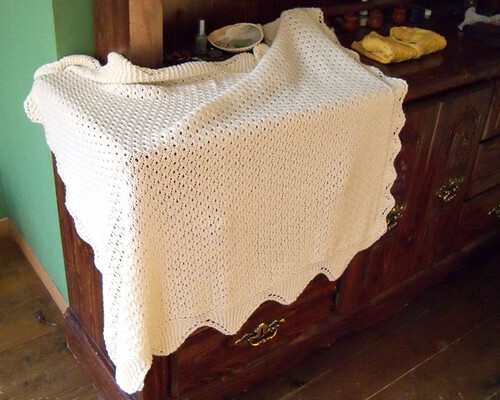 The first is the baby blanket which I’ve shown here a few times. I finished it in plenty of time, and then ignored the blocking until the very end. So I was a little surprised by the final size. But it’s just about perfectly crib sized! 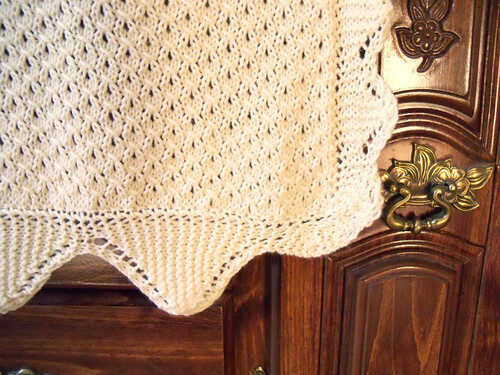 I used the same eyelet pattern which is featured in one of my shawl designs for the body. 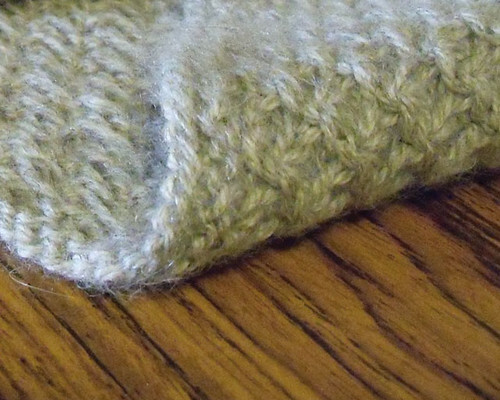 The edging is a knitted on border, improvised from a shetland lace edging. I fudged the corners with some short rows as I came to them. Each is a little unique… The triangles are wider on the long sides to add some extra width. I’d left more yarn than needed for the edging and wanted to use up as much as possible. 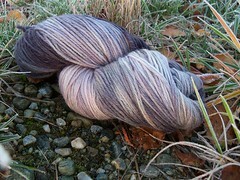 The yarn is Webs Valley Superwash, two massive hanks of 100% superwash merino. This is the kind of yarn that makes non-knitters go “wait, this is WOOL? !” because it’s just that soft. 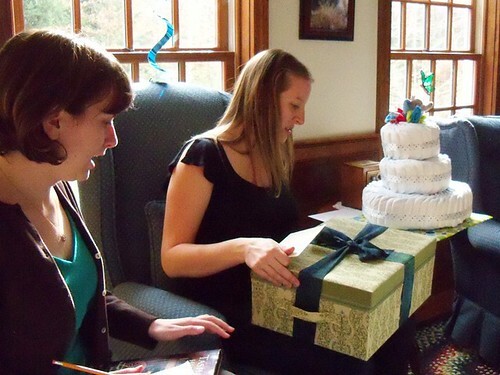 The second gift I didn’t blog about so it would be a complete surprise. 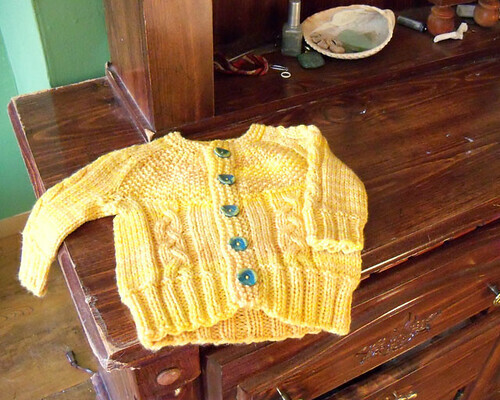 It’s Joeli’s Rice Pudding cardigan. 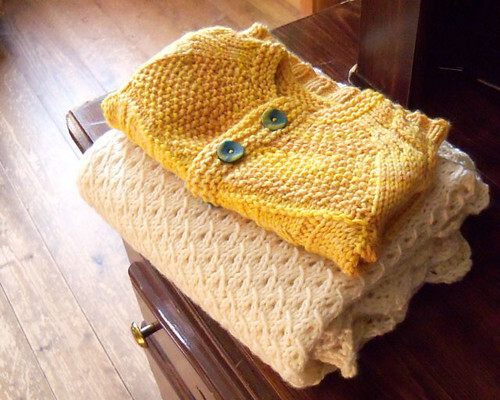 I knit this out of Knitpicks Swish tonal yarn in a sunshine-y yellow. 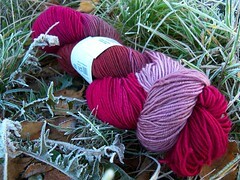 This is another superwash merino. I wanted to knit things for my sister which she could wash and dry. 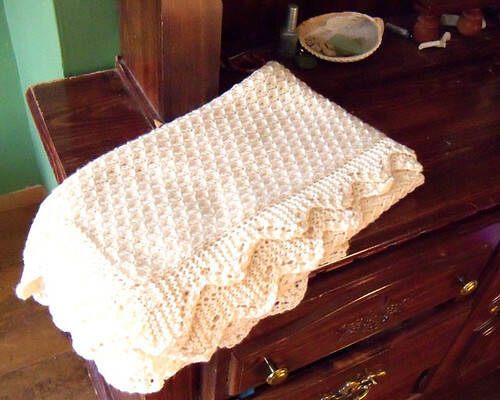 But I wanted to stick to wool, which I believe is much better for babies than acrylic. 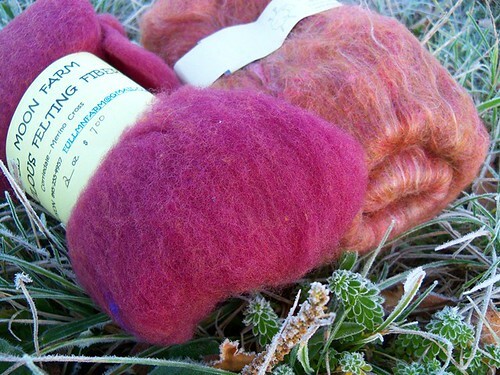 I highly recommend both these yarns as lovely, soft, and affordable wools for babies. 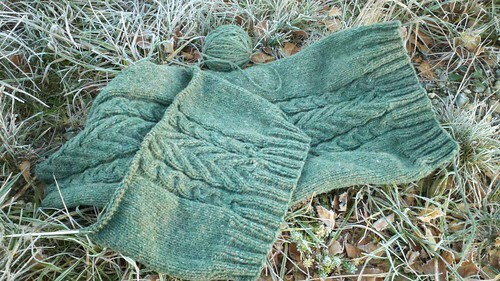 Joeli’s pattern is quick, fun- and written for an aran weight yarn. So I followed the stitch count directions for the third size, and came up with a sweater that’s about 20″ around. Hopefully that’ll be perfect for a baby who will be born at the end of December! It’s that time of year when I have to bring things with me to work if I want daylight pictures. So I can finally show you what I added to my stash last weekend! My plan was to buy fiber because I don’t need more yarn right now. Um yeah. I got just these two batts. But they’re very nice batts! Both came from the Ustler county spinning group (gild? something) and my plan is to spin them woolen and ply them together. My woolen spinning needs the practice. This was a total impulse purchase. I don’t even knit that many shawls. But look at the colors! So pretty! I couldn’t resist. They don’t count as stash, right? The red is STR mediumweight, I’ve never used it before and I’m excited to try. The grayish-purple with green is Cosmic Fibers Andromeda. 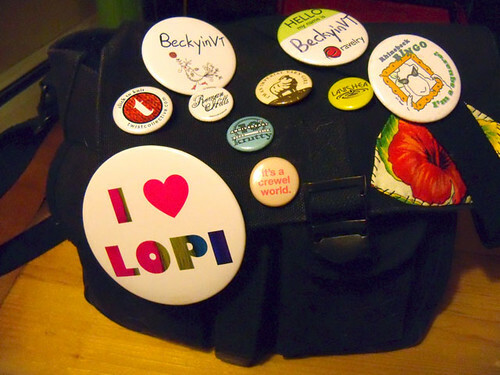 I got it at the holidome the night before the festival even started. These don’t count as sock yarn stash, because I’m planning on making a sweater out of them. 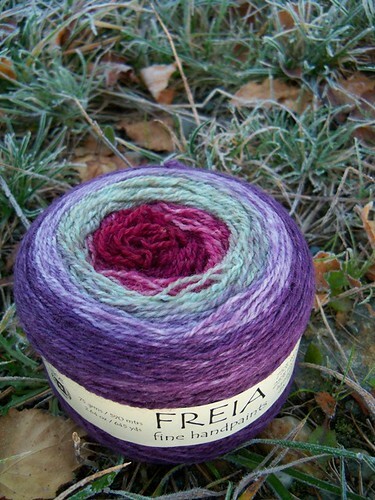 The plum is Periwinkle Sheep’s wink yarn. 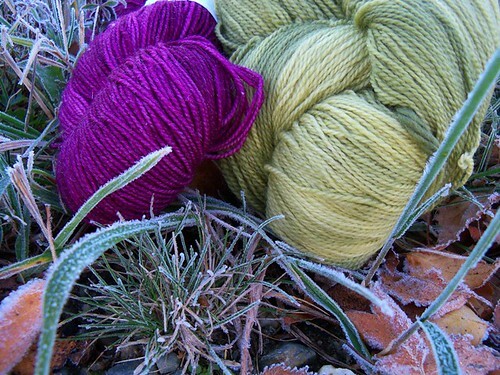 The green is Silver Moon Farm’s superwash merino. I’d like to make Moore with them. I’m not sure where I think I’ll find the time though. My final purchase was another spur of the moment. I was in the Homestead Heirlooms both full of gorgeous leather purse handles. I figured they’d be expensive, and when they weren’t I decided I might get one. 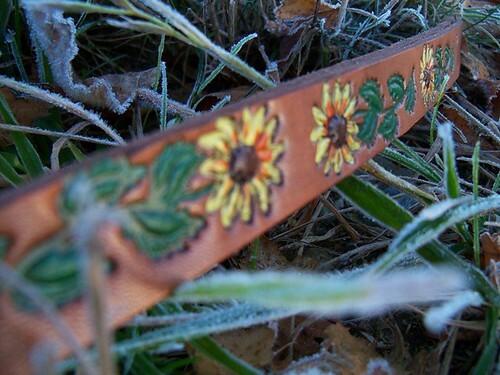 Then I found the ones with sunflowers and I KNEW IT WAS MEANT TO BE. So, um, yeah. That was slightly more yarn than I’d intended to buy. But I stuck to my budget exactly so it’s probably fine. I’m sure I’ll knit it all eventually, right? 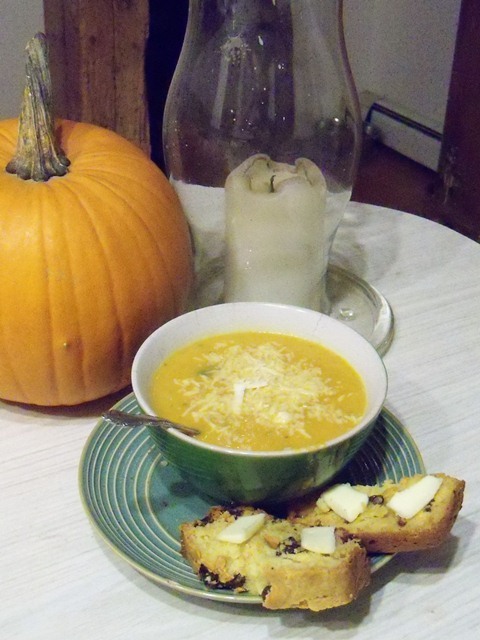 Soup and bread (with any luck) is going to become a regular Thursday feature here. See, I’m hoping it’ll become a regular feature in my Wednesdays*. Once a week (wednesdays) Neil’s going to school a few hours from here. So that means wednesdays are always my night to cook. And I’m trying to cook things that will still be tasty when he gets home at 9:30. Chop the carrots, throw them in a pot and cover with water. Put on the stove to boil until just tender. Remove from the stove and drain BE SURE to save 1 C of the water. Put the carrots, reserved water, and chicken broth into the pan and puree with an immersion blender (or do this in a food processor). 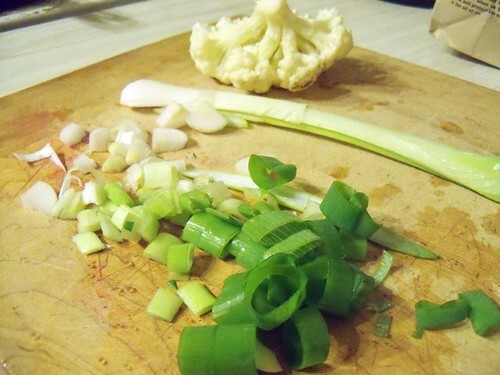 Chop the onion, garlic, and cauliflower finely and saute in olive oil. I used roasted garlic cloves because I have them on hand! Throw the sauted stuff into the soup. I like a little chunkiness in my pureed soups. If you don’t, you should puree these bits too. Dump in the coconut milk, 1/2 Tbsp salt, 2 tsp ginger, 1/2 tsp thyme. Add pepper (and more salt?) to taste. 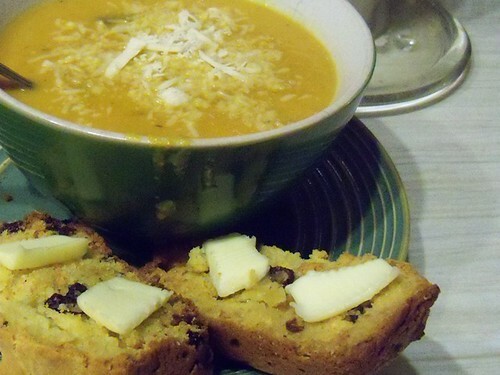 I’m eating this soup with irish soda bread (using the recipe from the Joy of Cooking) I highly recommend it! *Which means you can expect more mediocre food photography. Because it’s always dark by the time I eat. So what did I knit for my 10 extra hours? Well I have a bunch of designs in progress but NONE of them were ready for knitting. I thought I was going to grade a sweater on Thursday night. That plan was clearly insanity, I was much too excited and distracted. So I took along my Roam tunic. Having something I can knit without having to give it a lot of thought is important to me. Roam is fun and just cable-y enough to be interesting. AND! It’s now more than half done. I’m a bit like a kid on christmas eve! I’m going to Rhinebeck tomorrow!! I’m SO EXCITED! Amy and Dana and I hit the road tomorrow (but not in that van above, we’re not that cool) We’ll be at the festival ALL WEEKEND! Wheeee!! You’ll be able to recognize me. I’ll be the one with more flair than is really necessary… I’m playing Rhinebeck Bingo again this year, but feel free to come say hi even if you’re not playing. I’ve got my knitterly outfits all planned out. Sunday day I’ll be wearing Stammel. 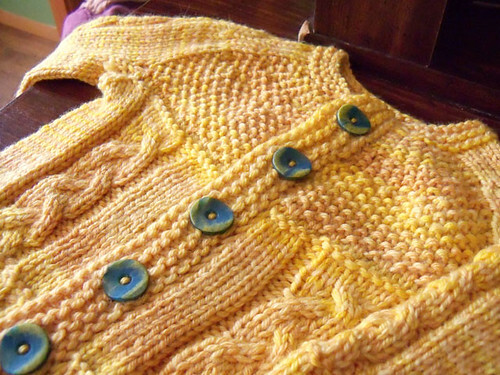 But Saturday I’m really excited – I’ll be wearing my design for What Else would Madame Defarge Knit! I’m just going to be a walking preview all day. So if you’re going too I hope I’ll see you there! I’m kinda bad at names, so, um, if I don’t recognize you right away please forgive me. I swear I’m friendly! I was swatching this nifty little stitch pattern recently. And the swatch wanted me to p3tog, yo, and then p3tog again all with the same three stitches**. For the first swatch I figured I should do just what the stitch pattern directed before making modifications in the second and third swatches. Faced with the prospect of LOTS of p3togs I thought this would be a perfect opportunity to test out my new(ish) Hiya Hiya sharp dpns. These found their way home with me from TNNA (yes, way back in June) and I’ve been looking for an excuse to test drive them and let you know how they work ever since. And you know what? I’m sad I waited this long! These needles are beauties. The tips are (as advertized) sharp. They’re not stiletto sharp, but then I’ve pricked my fingers on those suckers so it’s ok for some needles to be a little less dangerous. They’re certainly sharper than Addi lace needles though. And unlike the addis these pretty needles are made of stainless steel. So if you’re allergic to the nickel, brass, etc… class of needles you should really give these a shot! The steel is very slick and makes for quick knitting too. Even better, I suspect the needles are hollow because they are a very light weight for their size. It’s almost a shock the first time you hold them. I haven’t tried too hard, but this doesn’t seem to put them in any danger of bending either. 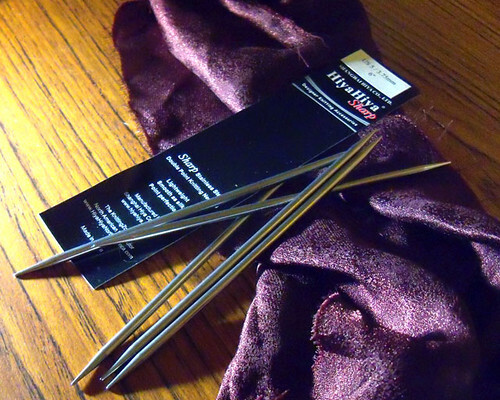 So these needles are: sharp, slick, strong, and stainless steel == definitely worth a try***! Find out if your LYS carries them! *Pardon the dark photos. Apparently it’s that time of year again. Already. **Don’t worry, I figured out how to make those k3togs – still a little tricky but not nearly so bad! ***See what I did there? Yay alliteration! Neil and I tackled a different kind of craft project last weekend. 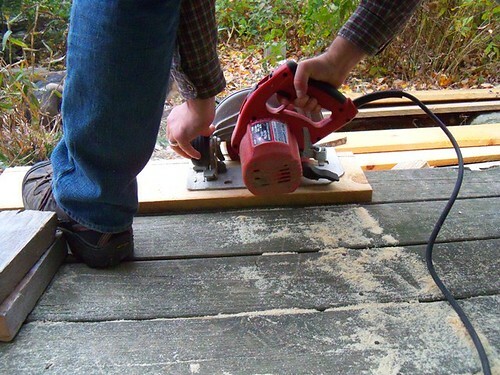 one involving slightly more lumber and 100% more power tools than you might see amid my other ramblings. We needed a new box for storing our firewood. The majority of it gets stacked on the porch. But having to go outside every time we need to put another log on the fire gets old fast. Especially in the really cold spells when NOTHING makes us want to go outside except double dares and the need for more firewood. 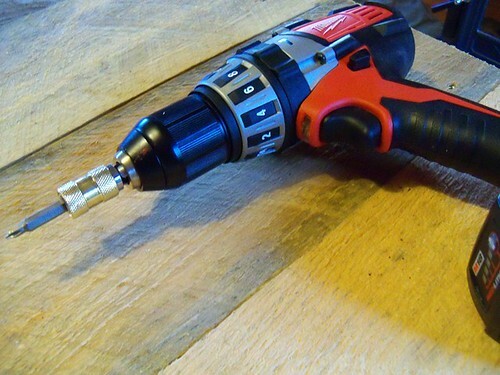 Also, this was an excellent chance for Neil to play with his birthday present – an new cordless drill! 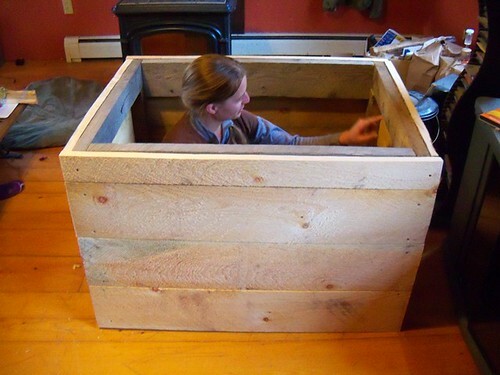 But for a box that’s going to take the abuse of 4 cords of fire wood passing through on the way to the stove what we really wanted was something durable and rustic. Also large. This is a very large box. The comparisons to my first sweater are startlingly easy to draw. 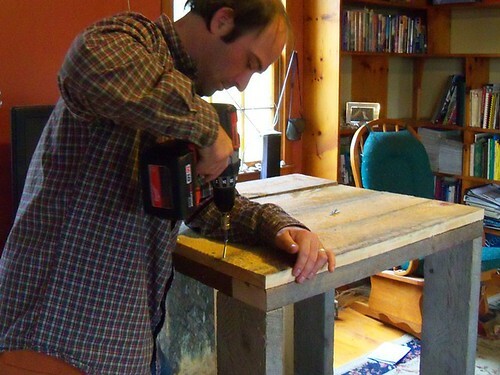 The materials are solid and rustic. Good quality but not the fanciest out there (brown sheep lamb’s pride and knotty NH white pine respectively) The edges aren’t straight (in either case). I got exactly what I wanted, but I can see plenty of places for improvement. I know just enough to try my best, but don’t have quite all the right tools. I don’t own a square, I was marking square edges on the lumber with a book. I didn’t own a yarn needle when I seamed my first sweater. I sent out separate e-mails to the volunteers who wanted to test knit, and those looking to test cook. It turns out there was a lot of overlap and several of them asked why. Good question, after all, we’re the ones who thought there’d be overlap in the first place. Oops. My squash plants all succumbed to beetles this summer. I heard a gardening expert comment that they were so hard to get rid of because they over winter in the soil. So unless you wanted to burn them out there was little you could do. It turns out that after watching my squash vines wither and die the concept of burning them out was VERY appealing. So we had a little garden bonfire last night. We’re only halfway through October, and the notch over mount Mansfield has already gotten it’s first snow! Not very much snow, but still a sign of things to come. I’m going to Rhinebeck next weekend! If you see me there please come say hello! I’m driving down with friends, so there will be extra knitting time. But I don’t have a project ready to go. That’s right, a whole book’s worth of knitting and no project ready to go next, argh!